This publication, accompanying John Moore’s first exclusive drawing show, is composed of eighteen charcoal works, all completed in 2009. An ambitious endeavor into a medium that the artist had only previously handled while in college, these large-scale drawings each have a unique subject and are not studies or preparatory drawings for paintings. Seeking a break from painting, his sole pursuit over the last decade and the focus of a mid-career retrospective in 2009, the artist was drawn to a total immersion in a new medium. Charcoal’s flexibility and variety of hues enhances the depth of field and the articulation of architectural forms - longstanding hallmarks of Moore’s work. The density of the heavily worked charcoal achieves a surface richness akin to painting. 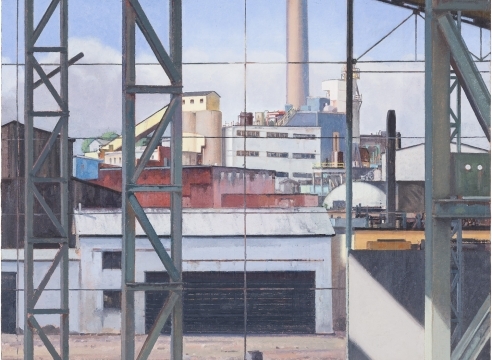 Each work also reveals Moore’s own analytic approach to the urban landscape and architecture - lifelong interests.